The Garmin Vivoactive Black GPS Enabled Running is our best running watch, which lets you integrate notifications and stats with your phone and can give you up to 3 weeks of battery for watch mode and 10 hours with GPS mode. The display can be read in sunlight and accurately track total time, laps, distance and all other metrics for running. 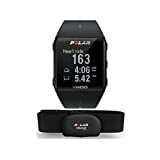 Our step-up pick is the Polar V800 GPS Sports Watch and this GPS running watch also has compatibility with sensors specifically made for cycling and running using Bluetooth technology. It is a great running watch for athletes as well as those who want to train to beat their personal best. The budget pick is the Garmin Forerunner 15 Large Black Blue and as a great distance tracker, it also has an inactivity indicator to get you moving. It may also calculate heart rate with the right device and can be paired with a foot pad for running on the treadmill. You can attain your fitness goals with this budget running watch. A running watch is a kind of watch that is used mostly by athletes who compete in marathons, triathlons and the like. Unlike a regular fitness watch, a running watch is capable of splitting your total time into laps. Running watches can be used not just by athletes who run. Even those who perform cross training as well as cyclists a d racers can potentially make use of a running watch to time their personal best. One of the best reasons to buy or use a running watch is that it gives you more options that are tailored to running such as speed, distance, form and other factors that can be considered important for athletes or anyone who want to stay fit and have an active lifestyle. In addition to that, running watches can also function like your average smart watch or fitness watch such that it may take your calls, messages, social media notifications and so much more. This lets you connect with your friends, work colleagues and family even when you’re out jogging in the woods or traveling somewhere with your running watch. In general, having a fitness watch can help you stay fit. However, you should not be too obsessed or conscious about the stats and numbers in the fitness watch. This is because it can potentially lead to eating disorders that can ruin your lifestyle and thus, make you unhealthy instead of staying fit. Make sure that you use a fitness watch only as a reference and not take it seriously, since not all metrics are fully accurate in today’s technology due to the limited design and outside factors. Remember that fitness watches are only guides so that you can stay fit, but don’t really rely on them, and focus more on working out rather than counting the numbers. Ease of controls or menu navigation: a good running watch should have an easy to navigate interface. This makes it a simpler effort to see all of your current stats such as your current running time, distance traveled, laps and other factors. Some smart running watches may also detect your form and give advice on a proper running form. Time lap or split options: this is the most important part of the running watch because it will be helpful for runners. Most running watches will have at least 3 lap splits but some are customizable for your needs. Time splitting is something that other fitness watches do not have or don’t clearly emphasize, since they are general fitness watches. Sweat resistant and water resistant: do consider a running watch that has a rating of at least IPX4 or higher to be a truly water resistant watch that you can easily wear no matter the weather condition. Since you will be sweating a lot while running, a good running watch can be sweat proof as well. Shock resistant: since a running watch will have to withstand a lot of force from the runner, being shock resistant is important because it will be mainly used for rugged purposes and usually intense training, so accidentally dropping the watch is always a possibility. Being shock resistant helps you get more years of training out of your running watch. Kind of sport or activity: while most running watches out there are going to be used by athletes like runners and those who compete in triathlon, basically anyone who usually tracks speed can make use of a running watch, as mentioned above (cyclists and racers). In addition to that, cross training is also a good opportunity to use a running watch for athletes who do so. Cross training may involve running so a running watch can be worth buying. Backlit display is adjustable: a good running watch to consider is one that has an easy to sey up backlit display so that you can easily see the numbers during the day when the sun is up and glaring, yet will not blind you during night jogging or running or during darker times of the day (e.g. when it rains). Fitness watch features or activity tracking: most running watches out there can function much like a regular fitness watch, such that you can track basic activities such as your number of steps, your sleep quality, the distance you traveled and other simple statistics. Phone integration: as with all types of fitness watches, the running watch can potentially sync with your phone so you can also answer calls, check social media notifications and potentially reply to texts. 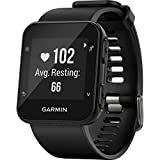 Our best running watch is the Garmin Vivoactive Black GPS Enabled Running which uses GPS3 technology for tracking your location and distance traveled as well as your speed. It can be used not just for running but also for other sports like golf, cycling and swimming. It is also an activity tracker and it has a color touch screen display. It is also completely waterproof for the purposes of swimming. It has a 1 year warranty. The only con about the Garmin Vivoactive Black GPS Enabled Running is that because of its price, it might not have the other higher end features of more expensive GPS running watches. The Polar V800 GPS Sports Watch is our step-up pick and has compatibility with a heart rate sensor. You can use it for running, swimming and other similar sports. You can measure your total distance, speed, route and the like while running or hiking. It is waterproof up to 30 meters under water and can also give you motivational feedback after your physical activity. It also tracks the basics like your calories burned and total steps. 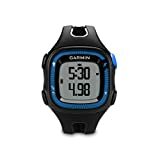 Our budget pick is the Garmin Forerunner 15 Large Black Blue and is a running watch with data on your personal records as you run. It can run for up to 5 weeks in watch mode or 8 hours in training or GPS mode. It also counts your steps as well as calories. You can also use its social media and Garmin Connect feature to share your achievements and progress with family and friends. It is also waterproof up to 50 feet. The TomTom Runner 3 Cardio GPS Tracking can take up to 11 hours of GPS mode and 3 weeks of watch mode. It gives you info on your calories, distance, pace, trail, speed and many more. It also gives you live stats on your routes and can also detect your active minutes and sleep quality. This running watch has an HR monitor and is water resistant up to 40 meters. Its touch screen navigation is very simple and is ideal for most sports. The design is very sleek and slim for low profile running through your trails and training ground. The Epson Runsense SF-810 GPS Watch has an easy to set up lap timer and can sync with most fitness apps. It has an HR monitor, a stride sensor and a high quality GPS sensor. You also get notifications with vibrations for alerting you with your current training program. It can last up to 20 hours with the GPS on, making it very long on battery life. It even has an interval training feature and it measures your cadence as well. You can not only track your stats but also help achieve your target heart rate. The Suunto Ambit3 Vertical Running GPS Unit is highly accurate for ascent and descent elevation changes for running uphill and downhill. It can sync to your smartphone for social media sharing as well as phone notifications and such. You can also track your sleep quality, recovery and other activity status with this running watch. It has Bluetooth support and can also be used by cyclists. The band is pretty sturdy and can also measure bike cadence, speed and others. It is compatible with foot pad as well. The Garmin Forerunner 610 Touchscreen GPS Watch can help you explore new routes for running while it tracks your cadence, heart rate, distance, calories, total time and many more. It is great for aerobic fitness workouts and can give you workout feedback in real-time. You will find the touch screen interface easy to use and the GPS being super accurate. It also tracks your calories burned and you can store your data into your computer. It is backed by a 1 year warranty. The Garmin Forerunner 35 Watch Black is great not just for running but also for other sports. It is ideal for both indoor and outdoor lighting due to the display. It can give you social media and phone notifications wherever you are and has an accurate GPS chip. The slim design of this watch makes it ideal for swimming as well due to its waterproof capability. With a good battery life, it can also track calories, steps and is good for races and training. The Garmin Forerunner 220 White Violet has a slim design and is heart rate monitor compatible. It can track your route in real time and help you achieve a personal best. It also tracks your pace and distance while the display is colored for a cool look. The lightweight looks of this running watch makes it unobtrusive while jogging. The Suunto Ambit3 Peak-HR Running GPS Unit can survive up to 100 meters of swimming and can last up to 200 hours of battery life. It can also detect your altitude as well as the weather due to its barometer and altimeter. The GPS is accurate enough to detect your fitness activities. The other running watches did not make it to our list because they were not durable and were not really suitable for running because of the lack of time lap recording and splitting. Some of them also lacked in the water resistant and shock resistant department, which is crucial for every trainer, athlete or anyone wanting to use the running watch for their outdoor adventures. Q: What are the benefits of running and jogging for your health? It helps our bones become stronger. Going on a running or jogging spree is helpful because it is a weight bearing exercise. It is a higher intensity exercise so it will help with your bone mass compared to lower impact exercises. Running and jogging are both a test of power to help build stronger bones, especially with kids. Seniors need to jog, brisk walk or run every morning or whenever they can to maintain healthier bones. Running and jogging helps you lose weight faster. If your goal is weight loss then the first thing you can actually do is to run or jog every single morning. It is the least expensive of all exercise programs and you can do it alone or with a friend. Running and jogging for miles can help you burn a lot of fat and anything you ate within the past week or month faster than when you’re sitting at home. You can burn more calories as you go outdoors. If you have been eating too much carb-rich foods such as rice, potatoes and the like then you may need to go outdoors and jog or run for losing all of those carbs that can potentially cause obesity as well as blood sugar imbalance. Burning more calories can help you maintain a healthier lifestyle and running does the trick. Muscle strength can be improved. Because running and jogging are both high intensity workouts, you can build muscles, especially for your leg muscles, which do all the work when you run, but you can also occasionally swing your arms to add more workout to your upper body. Generally, muscular strength can be attained with frequent running or jogging. You get a bonus for your cardiovascular health. Running and jogging regularly is good for the heart, and is ideal for all ages, from kids to seniors (especially the seniors because they need it). Having a healthier heart can lead to a longer lifespan and can lead you to achieving more dreams in life. If you still want to live longer then you can reduce your risks for heart diseases by jogging regularly. It’s fun going outdoors for a change. Going outdoors is a very good thing since it has many benefits in terms of physical, mental, psychological and social aspects. There’s nothing like a change of scenery if you have always been stuck in your desk job or taking care of the kids at home. Going outdoors is very relaxing and energy boosting when you go for a jog. You get in touch with nature. Going outdoors gets you in sync with Mother Nature, especially if you jog on a subdivision that is barely developed or go through the woods during the early hours of the morning (make sure you’re properly protected or armed in case danger occurs, or better yet, go with a jogging companion). Breathing fresh air is something that indoor exercises cannot replace, and is something that only outdoor activities can give you. You meet all sorts of people and go different places. Going social should not be limited in the gym while working out – you can meet many people while jogging in the morning, make friends or get in touch with old batch mates. Going outdoors can be like going to the gym – except you have a wider space and a better sense of freedom instead of a clumpy indoor exercise room full of sweaty people, which can be uncomfortable at times. It’s a stress-relieving exercise. There’s nothing like breathing fresh air and running uphill or downhill or across the fields or through the woods with someone or alone. If you’ve been stressed lately due to bills, your boss, your employers, your teachers at school or even your family and friends, you can find yourself and meditate by running or jogging outdoors to relieve all of that negative energy to turn it into fat burning positive energy. You can catch your breath easier with frequent running and/or jogging. One of the key benefits of running or jogging is improving your endurance and your breathing technique. If you originally get too tired easily after running or jogging for longer periods of time, with gradual practice and workouts every single day, you can improve your breathing by running or jogging often. You can prove your self-worth by competing in sports, triathlons, marathons and the like. If you are a sporty person, you can actually compete in such events. Kids, teens and even adults who want to set a goal for themselves as a future athlete may want to pursue running as a real life goal. Q: How is running different from jogging? No matter which you choose based on your preferences, either running or jogging, you should always warm up first before doing any of them by stretching and the like so that you don’t hurt your lower body muscles or any part of your body. Q: How does running compare with long and brisk walks in terms of calories burned? Q: Does running help you become smarter? A: The activity or running has been studied and known to boost your brain mass and can therefore potentially help your brain become healthier (and possibly make you smarter). The science behind this is that you can get better memory with constant running or jogging due to the creation of brain cells to help improve your ability to remember things. This is helpful for students and anyone who needs to memorize things. While running is a good brain food, it can also help you whisk away negative emotions and stress that can cloud up your thoughts, resulting in better concentration and problem solving skills. Q: How is a GPS running watch different from fitness tracker and a smart watch? Q: What are the key benefits to owning and using a GPS running watch? You can challenge yourself every single day by checking your previous times. The running watch lets you constantly improve your running in any way that you can so that you do not get bored with simply running every single day. A running watch can give you information on how to get better due to its specific stats that are tailored to running. Running is a good weight loss activity, and you can monitor your calorie intake with a running watch. Like all fitness watches out there, the running watch has the ability to track your other statistics such as calorie intake. This is helpful for those who are into a weight loss journey to be able to stay focused when they want to keep running using a running watch. Contrary to popular belief, a GPS running watch can still be used indoors, with the right settings. This lets you work on the treadmill or elliptical and it will still count your calories burned and other stats. If it is raining, snowing, cold or storming outside and you have to stick with your indoor machine or do some sit-ups at home, you can still use a running watch to track your calories and other movements. Because the running watch uses GPS, it is the most accurate when it comes down to tracking your distance. It may not be completely perfect since today’s technology is still far from being 100% accurate, GPS running watches provide higher levels of accuracy as compared to regular fitness watches anyway. Split times can be measured with a running watch. The goal of a running watch is not just to beat your personal best but also to record your split times, which is important in any runner, whether you’re a professional, a cross training athlete, or just running for fun and / or for health purposes. Q: Why is GPS tracking better and why do I need it in a running watch? GPS tracking helps with distance tracking, because it measures your current location in real time so it calculates the distance you have traveled as accurately as possible. GPS is commonly used in golf to easily locate where the ball might have landed on. GPS is one of the most accurate tracking technologies out there that is available today. A simple example would be the ever-famous mobile app Pokémon GO, in which a player’s total distance walked is computed and accumulated to hatch an egg. Because GPS is very accurate, your calorie counter will also become more accurate. This is crucial to those who are on their way to weight loss and want to know how exactly many calories they burned in one course of running, jogging or brisk walking. Q: What are some stats that are important to know when using a running watch? Vertical Oscillation Measures how much you bounce your body when you run, walk or jog. 6 to 13 centimeters You should keep it low so that you don’t get tired easily when you are running for miles due to too much bouncing. (Foot Strike Rate) It is the number of steps that you make per minute (SPM). Cadence can be used for either running or cycling. 150 to 200 steps per minute Getting the best cadence or SPM is easy if you have a good playlist or song with an upbeat tempo of about 150 to 180 BPM. HR Max The maximum heart rate you can get on your most intense level of workout. Depends on how old you are and your lifestyle It’s not changeable but you can minimize your resting heart rate instead by building endurance. BMR Basic Metabolic Rate or BMR is your basic calorie burning rate when you’re not doing anything. 1,400 (women) and 1,600 (men) It’s important to know your BMR so you can have an idea whether you need to exercise a lot or just a little. VO2 Max VO2 max is your oxygen consumption ability, and can get higher when you practice more physical activities. 40 to 46 mL/kg/min Running or jogging more can increase your VO2 max. Resting Heart Rate Your resting heart rate is your heart rate after you exercise as compared to your pre-exercise HR, and can be measured using an orthostatic test. Should be close or similar to your pre-exercise HR Consider resting more if you’re 10 BPM higher than your average heart rate. Heart Rate Zones The HR zone uses your HR max data and gives you the ideal heart rate depending on which kind of training you want to go with. Depends on your HR max Heart rate zones are ideal for knowing whether you’re doing a low intensity or high intensity workout. Q: Why is elevation gain important in running watches? A: Elevation gain or elevation changes can be overlooked on most running watches, but some do have this data so you should make use of it. Elevation changes can impact your running speed so don’t assume that you’ve done a slower run – make sure you know whether the elevation changed on your running course or not. Q: What causes GPS running watches to be inaccurate sometimes? You may have your own personal route and may tend to go on different areas of the course other than an exact pre-determined location as measured by the USATF (USA Track and Field) association. GPS can potentially have inaccuracies because they are still a new technology and satellites aren’t really a plenty yet, so accuracy is still a common issue with our current technology today. Make sure that the course you are running is USATF certified (or certified by a similar governing body in your country) to make sure you know the true distance as measured scientifically, so you can compare it with your running watch’s stats. Obstacles can get in the way of satellites sending out data to and from your GPS running device, such as trees, buildings and the like, causing inaccuracy sometimes. Q: How much should I wait after a meal before I get into a running spree? A: If you’re itching to run after a good meal, you should consider waiting a certain time period. Here is a chart comparing different food types, but take note that this is depending on how fast your stomach can digest your food. Q: What are the two most important features of a running watch that beginners should not overlook? The lap function, which sets it apart from regular fitness watches, allows you to set time splits and determine how fast you can go based on laps. Time intervals can be great for determining how much your running style has changed through the course and what you need to improve on. Q: How can I get motivated to run outdoors if I’m feeling blue? • Leave your past behind, especially if it’s not a good one. It’s always a hard thing, especially if you’re a sensitive person, but you can do this if you get help from family or friends. But ultimately, you’re the one to decide whether the past is worth remembering or not. • Set a goal for yourself to move on, such as pursuing a specific distance for running. • Don’t go too fast and don’t get too hasty or insecure with professionals on speed. No one is an expert at first, so don’t get intimidated by other people. Be happy with what you can do and learn to accept your flaws to become better someday with constant practice. • Distract yourself when you get tired by playing road games like you would on your car road trip. • Team up with a friend or someone you trust when running outdoors. There’s nothing more comfortable than jogging or running with someone you really care about (e.g. best friend, boyfriend or girlfriend, work colleague, sibling, family and anyone else). You can share stories along the way and have a blast while you’re unaware that you’ve walked for a certain distance already – and you feel good! • Discover new routes in your neighborhood when you run every single day. • Don’t forget to love yourself – it’s okay to buy rewards for yourself from time to time. • Waking up early can be a good mood booster. • End the day in a nice way with a good meet-up with friends or family, or treat yourself to a nice cold glass of beer, wine or juice. • Listening to your favorite music (especially upbeat and cheerful music) is one of the best ways to motivate you. If you want to move on from an ex, you can blast high tempo breakup songs to help you let go of the past while working that sweat away. • Get in touch with your neighbors as you run – it’s good to be sociable once in a while. • You don’t have to wear your wearable tech all the time – some people get conscious and insecure when they track their stats all the time. To free yourself from insecurity, you can leave it at home if you wish. • On the other hand, you can also use a fitness tracker or running watch to constantly beat your personal best and log it in. This one is ideal for those who feel bored with running. • Always find time to take a break and relax after running for some time. Your body needs to rest after running too much, so make sure you continue to love yourself by not wasting too much energy and staying healthy. Remember that running, as with any physical activity, is a good mood booster, but it might not be everyone’s cup of tea. These motivational techniques may also be applied to other exercises other than running, so we hope you learn from them! Q: Can treadmill running help me improve my running pace? A: Yes, indoor treadmills are good for helping you train for the real thing. If you are having problems with running uphill at a higher pace then you can train with the incline feature of a treadmill to help you get more endurance out of your every run. Q: What is the importance of proper hydration and diet when running? A: If you often run or jog on a regular basis then it is important to keep yourself hydrated and have the right diet plan. Eating carb rich foods can help you maintain more energy and stamina while getting hydrated after a few miles of running can help you revitalize yourself. Energy drinks are better, of course, but when the going gets tough, water is a good choice. Q: Why should I let go of tension while running? A: Too much tension when you are running can be a bad thing because you are squeezing your muscles too hard, making it difficult to run at a good pace. The technique is to practice your grip and make sure you loosen up and completely relax while running. This ensures that you don’t put too much tension on your muscles, especially on your shoulders. Too much tension can lead to wasted energy, which can compromise your running performance, pace and stamina along the way. Q: Why is running beneficial for kids, teens and the youth? Kids have a lot of energy so they need to release that energy in some form or manner, such as running. Instead of wasting their energy on other mischief, getting them to run is a better choice for their health. Children who run in their early life can decrease the chances of osteoporosis later in life due to better bones built with running and jogging regularly. Kids who run often will have better self-esteem and positive thinking in life. Running can help release positive vibes due to the release of endorphins, and can help children take out stress as well. Running is also a great way to prevent obesity later in life for kids. This is important if you have a line of obesity or some other illness in the family. As we mentioned above, running enhances memory skills, so it is beneficial for students. Children can remember things more from their teachers and for their exams if they regularly jog or run. Q: What is the run-walk method and why is it important? Q: What common injuries can I possibly get from excessive running? Runner’s knee: this happens because of lack of leg strengthening exercises and can cause knee pain due to muscular imbalances. To prevent it, simply build more leg strength. Plantar fasciitis: this happens when your plantar or under foot gets used up too much. Avoid too much load transfer on your lower legs and strengthen your glutes and hips. Don’t forget to rest when you need it. Femoral Acetabular Impingement: this basically translates to hip pain or glute pain, making it hard for you to sit down or do squats. You should take it easy and rest if for a while and you can also strengthen your joints and perform better stretching warm-ups before running. Q: What gear should I have before running? The Garmin Vivoactive Black GPS Enabled Running is our best running watch with up to 3 weeks of battery, colored touch screen display and waterproof qualities.